An hour later, I showed up at my sister’s with bunny ears, baskets, candy, plastic eggs, and a dozen Easter themed Kinder Joy eggs. We may be Jewish but personally, I don’t think that’s any reason to deny ourselves and our kids an Easter egg hunt. We paint Easter eggs, eat Easter treats and go to Easter egg hunts every year. I look at it as a fun way to celebrate the beginning of Spring. Even though, on this particular Sunday, it was 30 degrees outside and we were having our hunt 16 floors up in a NYC apartment building. I don’t like to quibble over the details. While the kids played, my sister and I disappeared into her bedroom to get everything ready for the hunt. She took one look at my loot and got very concerned. Once that was settled and all potential tantrums were pre-empted, my sister brought the kids into the hallway of their building and I hid all the eggs around the apartment. I probably should have counted all the eggs before we started but I didn’t realize that until I was practically finished with hiding them. Oops. Lesson for next year. When I was finished, I opened the front door. 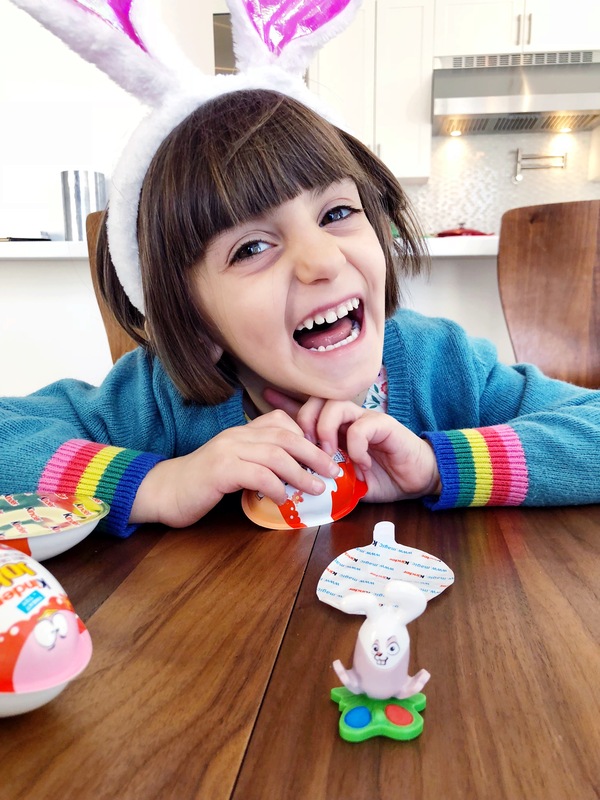 Now that one of the special Kinder Joy eggs was uncovered, we reminded the kids that they would each get two of them, guaranteed. They all seemed to breathe a collective sigh of relief. My sister is always right about these things. And then the hunt continued. In the end, each kid has a basket full of goodies to open, play with and eat. That’s always the best part of the hunt. When the mayhem is over and everyone goes through their loot. Jack and Neve couldn’t wait to open up their special Kinder Joy eggs first, and Mazzy and Harlow saved the best for last. Kinder Joy is the ultimate Easter egg find because one side contains the toy and the other a soft creamy layered confection you eat with a spoon. I don’t know how to describe it exactly, except pure deliciousness. Kinder Joy has been around since 2001 and is sold in more than 100 countries. They’ve sold more than 3 billion eggs in the past 17 years worldwide! You can recognize the Easter themed Kinder Joy eggs because they have pastel colored chicks and bunnies on the top. They each contain an Easter-themed toy; ours was a little bunny with paints by the paws and a tiny paint brush inside. Speaking of painting, that was the next item on our Easter agenda. All in all, it was a very successful pre-Easter celebration. That is, until it all almost got derailed on our way out. That was Jack again. Remember what I said about not counting my eggs before I hid them? I guess I had hid nine Kinder Joy eggs instead of eight. Eggs at our house were always hidden in groups of 3 (myself, and my 2 siblings). The Easter Bunny left a note (and his handwriting looked suspiciously similar to Santa and the Tooth Fairy), with instructions. Like-eggs in these colors are for one person, another color goes to someone else, etc. Or solid colored eggs go to one person, ones with different top/bottom color to someone else, and one with a symbol drawn on them went to the third person. That way it was evenly divided and as kids got older they could get personalized-I once got a CD instead of cheap toys and candy, so in the eggs there were letters I had to unscramble to find out where it was hidden! That’s how my dad does the hunts for the grandkids. Color coding and riddles like a military operation! It takes a good long while and is scrupulously fair. Though I am not 100% sure if the kids or Grandad enjoy it more…. This is a good tip for next year! Thank you! How fun! We always had 1 “lucky egg” growing up that had money inside. It looked like the regular eggs so we never knew who was going to get it. Somehow the tradition turned into the winner buying ice cream for her sisters so we were all happy anyway 🙂 Looks like your family is making fun memories too! I love that tradition! They get to feel special buying ice cream for everyone but everyone still gets a treat! Yes we color code all the kids also! Otherwise the 11 year old gets baby toys and baby candy. I know 11 is a little old for it but all the other cousins are little so we like to include her. And it NEVER FAILS – even if we do count the eggs and remember how many there are… there is always one or two unaccounted for! hahaha! I think I waited too long to do my easter basket – all my local stores are sold out of Kinder Joy eggs…. boooo.